Hellllllllllo everyone!! Oops sorry!! :D Did that “hello” affect your eardrums? Hihi! You must be wondering the reason for this sudden bolt of enthusiasm. Well, what else do you expect from someone who has just tried on a super unique product? Ladies!! 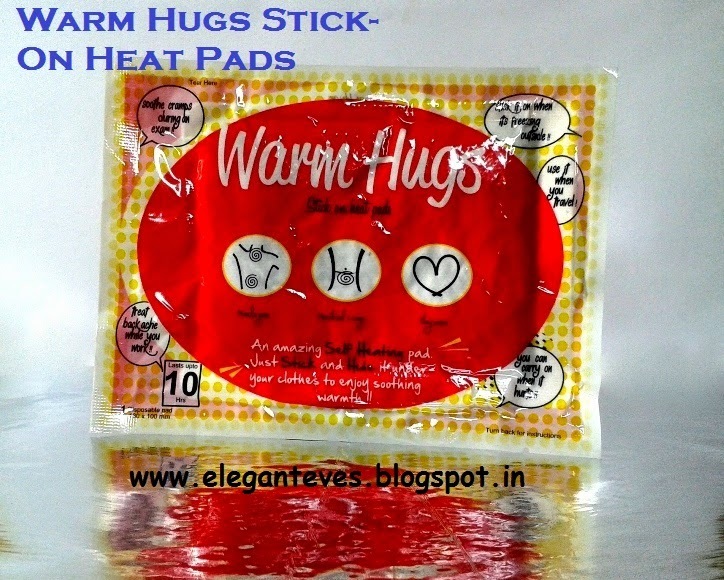 Today I present to you a wonder product called “Warm Hugs Stick-on Heat pads”. “Eh, What’s that?” you must be wondering right? Believe me; I had the same reaction when I heard the name for the first time until I had tried on the samples sent by the Warm Hugs team for reviewing in Elegant Eves. Packaging: It comes in bright and happy yellow n red plastic colored packets. I was sent three sample packets which were individually there in this kind of packet. I believe, commercially they are sold as a pack of 8 or 10. After opening the packet, you need to peel off the two stickers covering the adhesive side of the pad. Once the stickers are off, it is ready to be used. Just stick it on to your underclothes and wear your outer garments as you usually would. 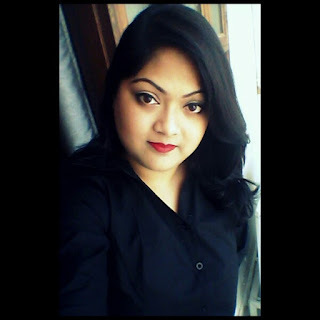 My take: I have always been a girl with problem-free periods (Touch-wood). But since the past one year, I have been experiencing terrible cramps on the second day. Also, to add to my woes, constant lower back pain is also my “best friend” now ! :-/ The one thing which truly gives me relief is a hot water bag. For my cramps, I press the hot water bag over my lower abdomen and for the back pain I apply some ointment topically and then press down the hot water bag on the area to get relief. But let’s admit it, most of the times, when you are cringing with pain, you are in no mood to get up yourself, heat water, pour it into the bag and use it thereafter right? And we don’t get the angel called “Mom” everywhere we go :’( Also, hot-water bags, although they provide immense relief, aren't very practical to carry around. Result?? Exam days, important meeting days at office and such occasions become a terror for us if we don’t “D-Date” is approaching. 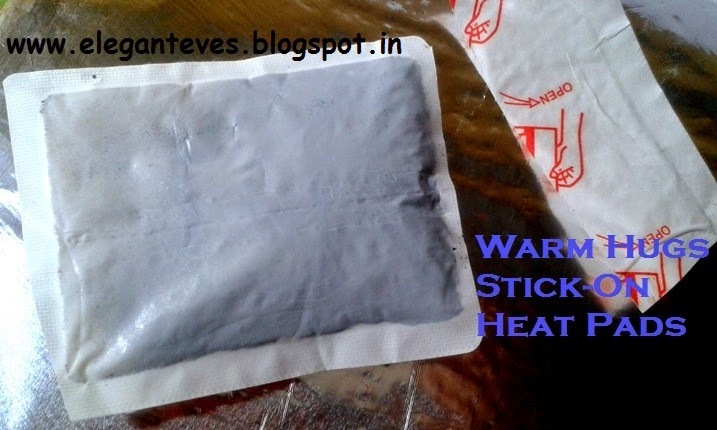 This is where the Warm Hugs Stick-On Heat pads com to rescue. It doesn’t require even electricity to heat. It heats up by itself within 15 minutes of sticking it on to the vest (Please wear well-fitted vests so that the heat pad comes in proper contact with the area). The thing is basically a pouch containing all the ingredients mentioned in a powdered form. The heat level on me is not as much as I get from hot water bags but nevertheless it is quite good. The most important thing which struck me about this convenience of usage! I can wear this and continue doing my work as I would normally :D Although the claims of 10 hours did not hold true for me as it remained warm for maximum 6hours on me. But that may differ from person to person. 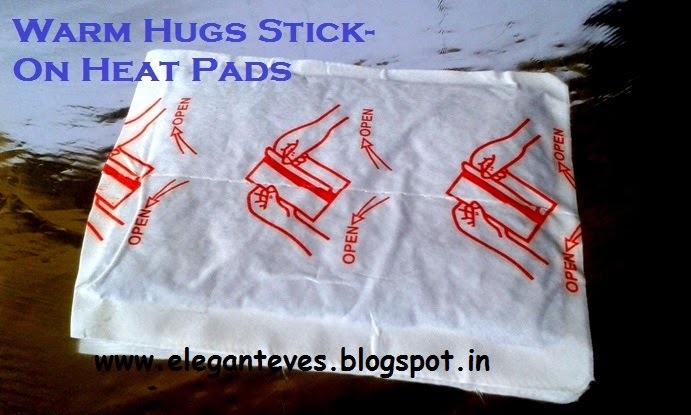 Also, the adhesive does not stain the cloth leaves no stickiness behind after the pad is removed. I have also made my dad use this for his lower neck pain and it provided relief to him too. 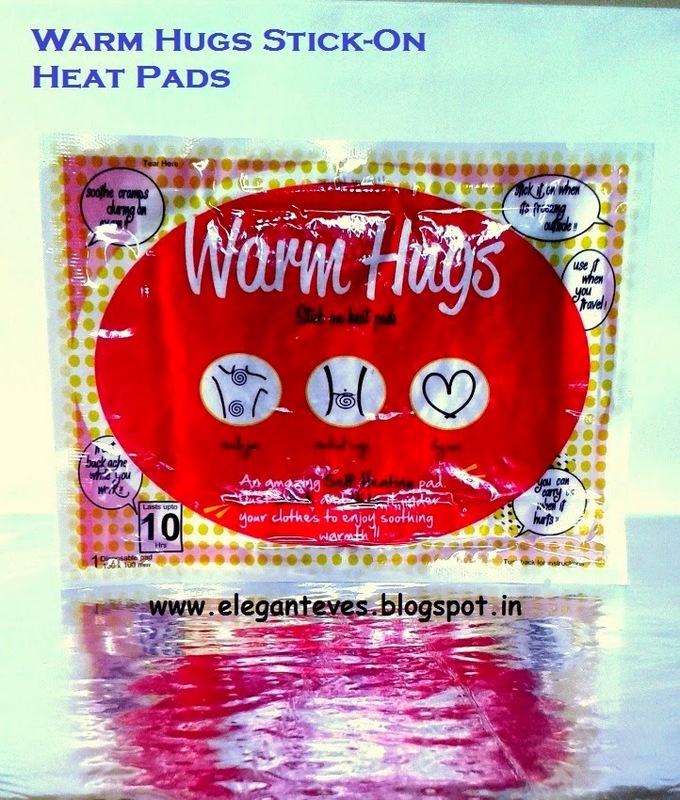 Recommendation: Elegant Eves recommend this product for all ladies on the go who needs the comfort of hot water bags even while they are not at home. This can also be a wonderful gift to homemakers who can use this to get relief from body ache of all sorts. So NOW you know why I am this excited ^_^ Grab yours NOW!! !